Join the call to practice COMPASSIONATE DISCIPLINE! Parenting Academy is an annual event brought to you by MLAC Institute for Psychosocial Services, Inc. It is a venue where everyone, NOT ONLY parents, can discuss important issues in parenting. On its 3rd year, the conference focuses on the theme: THE POWER OF COMPASSIONATE DISCIPLINE. 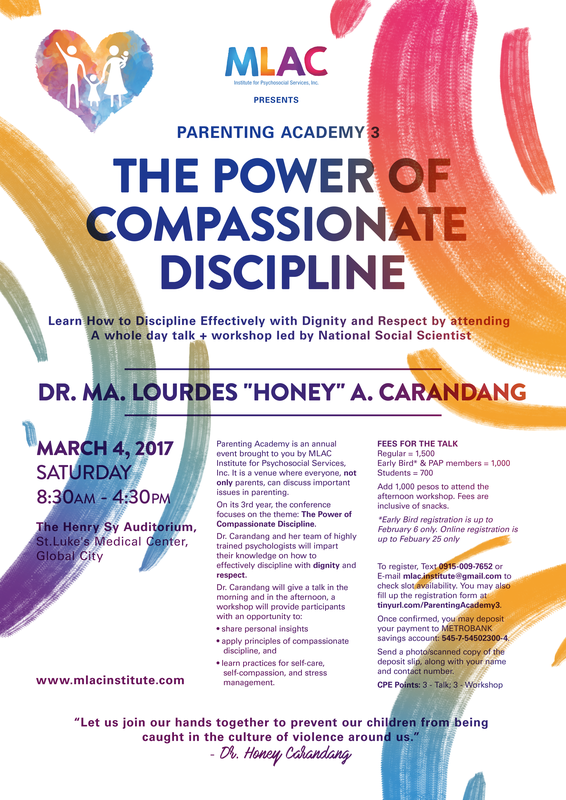 Dr. Carandang and her team of highly trained psychologists will impart their knowledge on how to effectively discipline with DIGNITY and to apply GENDER RESPONSIVE PARENTING (GAD). Add 1,000 pesos to attend the afternoon workshop. Fees are inclusive of snacks. Next Join the Call for Compassionate Discipline!